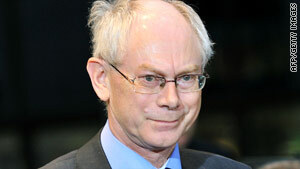 Herman Van Rompuy is "well known as a consensus builder," said Gordon Brown. Brussels, Belgium (CNN) -- European Union leaders named Belgian Prime Minister Herman Van Rompuy as the first "president of Europe" Thursday, edging out former British Prime Minister Tony Blair for a still-vaguely defined job. "I did not seek this high position, and I didn't take any steps to achieve it," Van Rompuy said in accepting the job. "But tonight, I take on this task with conviction and with enthusiasm." Van Rompuy, a 62-year-old, soft-spoken fan of Japanese poetry, will become the face of European Union and represent its 27 member nations at summits overseas. His conservative government took office in December 2008. The Belgian is "well known as a consensus builder," said British Prime Minister Gordon Brown, who added the selection was unanimous. And Jose Manuel Barroso, the president of the European Commission -- the executive arm of the EU -- called Van Rompuy's selection "a tribute to Belgium," the EU's host country.
" I think the European Union also expressed its gratitude for the work of Belgium and the constant support that this country at the heart of Europe has given to our common project," he said. In his speech, Van Rompuy pledged to lead the EU through a process of "dialogue, unity and action." "A negotiation that ends with a defeated party is never a good negotiation," he said. "As president of the council, I will listen carefully to everyone, and I will make sure that all deliberations turn into results for everyone." The presidency was created by the European Union's Lisbon Treaty, which came into force this month after years of torturous negotiations. Van Rompuy will serve a two-and-a-half-year term, replacing the six-month presidency of the bloc that rotated among the heads of its member states. But while the EU prides itself on being a club of democracies, the process of choosing its new leader was far from transparent or open. The people of Europe are getting no say, not even through their parliamentarians. Van Rompuy's new job was announced after a closed-door dinner for the EU's heads of state and government. The Belgian defended the process, telling reporters the selection was made by leaders "who were all democratically chosen." "I was chosen on the basis of a treaty," he said. "The treaty stipulates the procedure. The treaty was democratically approved by 27 member states." The EU leaders also named Catherine Ashton, a British trade commissioner and member of the House of Lords, as the union's High Commissioner -- its equivalent of a foreign minister. Unlike Van Rompuy, who was chosen by leaders of the EU's member states, Ashton must be confirmed by the European Parliament. Blair, who led Britain from 1997 to 2007, is currently the EU's Mideast envoy. He had been the early favorite for the presidency in recent weeks -- but Brown, his successor, realized that he lacked support among key decision-makers for new post, a Brown representative told CNN earlier. According his backers, who at first included French President Nicolas Sarkozy, he was just the sort of world-renowned figure to win attention for the EU and enable it to exercise its weight in world affairs. One Indian official told CNN before the announcement, "If the EU chooses as its worldwide representative the prime minister of Belgium or Luxembourg, I am not sure our leaders will have the time to meet him." But others were soon arguing that Blair's support for the U.S.-led invasion of Iraq and his close alliance with former U.S. President George W. Bush made him a divisive figure in Europe. And as the one man who might have been able to take Britain into the European single currency, he had not even attempted to do so while he was Britain's prime minister. Public backing from Italy's Silvio Berlusconi, a joke figure to much of Europe and another Bush ally, did not help. Brown had realized earlier that Blair did not have enough support among key decision-makers to snag the new post, a Brown representative told CNN earlier. CNN Political Contributor Robin Oakley contributed to this report.